A large piece of aircraft debris discovered on an island off the coast of East Africa in June was from missing Malaysia Airlines Flight MH370, an official announced Thursday. A search stretching more than two years has turned up few traces of the Boeing 777 that disappeared in March 2014 with 239 passengers and crew on board. The outboard flap found on Pemba Island, off the coast of Tanzania, will be examined further to see if it can yield any insight into the circumstances around the fate of the jet, Malaysian Transport Minister Liow Tiong Lai said in a statement. Australian and Malaysian officials examine aircraft debris that was found on Pemba Island at the Australian Transport Safety Bureau headquarters in Canberra on July 20. 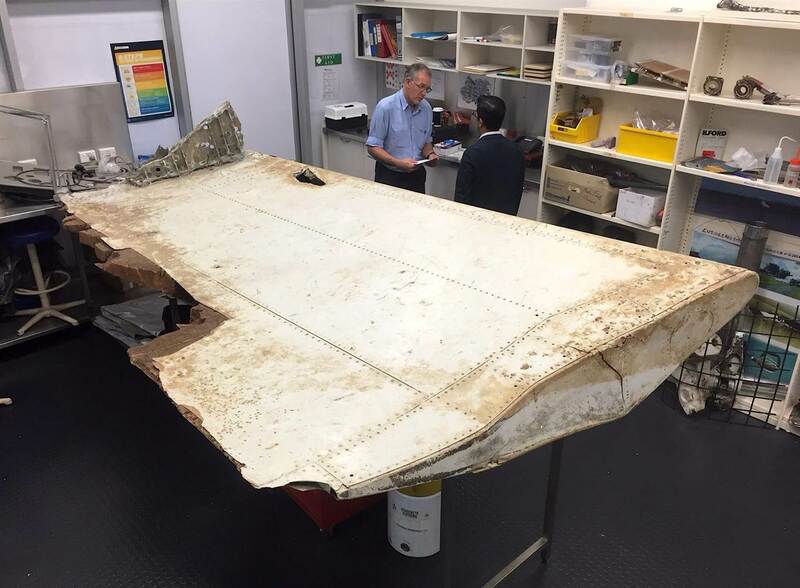 Australian Transport Safety Bureau / Handout via Reuters Investigators have previously confirmed a piece of plane debris found on the French island of Reunion in July 2015 as being part of MH370. They are examining several other pieces of debris found in Mozambique, South Africa and Rodrigues Island, a territory of Mauritius.